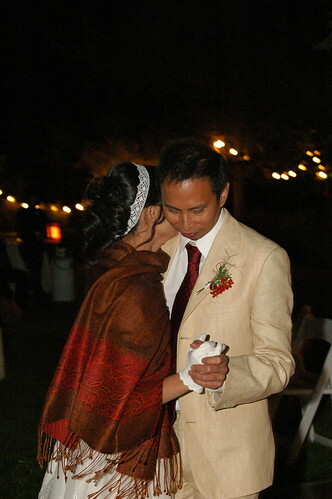 We're getting married October 3, 2009 in Paso Robles! Some of our photos taken by guests have been put up. If you'd like to upload them to our photo pool, please email Teresa at [ teresawinkymak at gmail dot com ] , and she will give you the username and password. Thanks to all our friends and family who helped out. It was wonderful for us to see everyone at the wedding. For those of you staying at the Courtyard Marriott, we will be offering a shuttle service on Saturday to get up to Windrose Farm. The ceremony starts at 2:30PM. Please let us know if you are staying at a different hotel and require shuttle service to Windrose Farm. Please let Heather/Teresa know which times you will require the shuttle - heatherkittymak@gmail.com or teresawinkymak@gmail.com. Please note that if you plan on driving up to Windrose Farm, there is ample parking available up there. However, note that at night the roads are not well lit and it is easy to get lost. Shoes optional ? Well its just a metaphor. The event is going to be relaxed event with good food, good company and music. We want our guests to be comfortable. So dress up; wear sneakers, sandals or just come barefoot if you like. As some of you know, our wedding is DIY affair and friends have been great at helping out. Does anyone want to carpool and lower the environmental footprint ? Let us know.